In an increasingly urbanized world, young people are getting fewer chances to experience some of the shooting and outdoor activities we take for granted. Shooting gives young people the opportunity to participate in an exciting and challenging sport that may be enjoyed their whole lifetime. Shooting teaches responsibility and self-discipline while developing concentration skills and building self-esteem. Because shooting does not place emphasis on strength, endurance, speed, or gender, boys and girls of various sizes, ages, and physical abilities can participate together on a relatively equal basis. Heritage Shooting created our NRA Youth SportsFest program to introduce young people to our American History and Heritage and the rewarding, lifelong sport of shooting! This program acquaints young people with a variety of shooting and outdoor activities in a festival-like event! It is a welcome opportunity for youths who might not otherwise get a shot at America’s outdoor traditions. 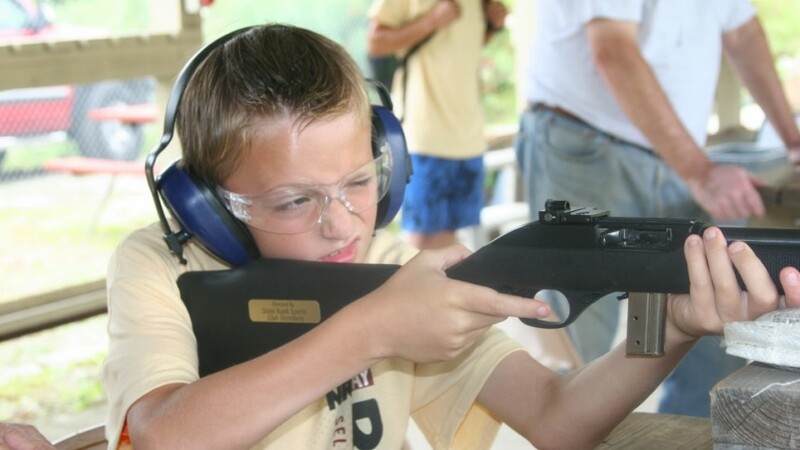 Our NRA Youth SportsFest is a recreational, non-competitive event designed to offer youths a hands-on introduction to the shooting sports and our American Heritage. This is an EXTREMELY popular program and we have a waiting list of children (and parents!) who want to participate, please contact us regarding time and seat availability by clicking here. Visit our Photo Albums for photos from past NRA youth SportsFest events!